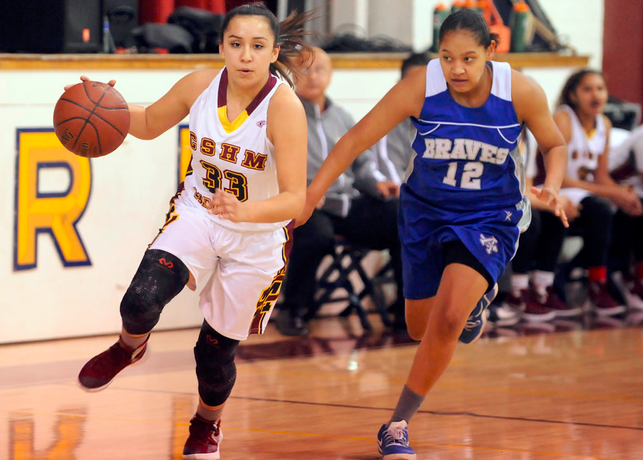 MONTEBELLO — Both of the Cantwell Sacred Heart of Mary High School girls basketball team’s previous two losses were the result of slow starts the Cardinals couldn’t overcome. This time, it was all about finishing. Camille Parker scored 27 points and Malena Martinez had 22 to lead Alta Loma to a 57-55 victory over Cantwell on Wednesday in the Cardinal Classic championship game at Cantwell High School. Parker scored nine of her 27 points during the fourth quarter as the Braves (8-2) overcame a 12-point deficit in the second half to surprise the Cardinals. Lily Perkins had 22 points and Victoria Guerrero 11 for Cantwell, which slipped to 10-3. Valeria Lizarraga also had nine points for the Cardinals, who cut the lead to 57-55 with two seconds left on a 3-pointer by Guerrero. But Alta Loma was able to get the ball inbounds to run out the clock. HACIENDA HEIGHTS — After losing in the title game of an early-season tournament, Claremont High School came through with a championship in the inaugural Wilson High “Battle of the Ball” Christmas Classic on Wednesday night with an 83-68 victory over Whittier. Claremont, which is ranked eighth in CIF-Southern Section Division 2AA, was led by junior guard Kyle Scalmanini with a game-high 20 points. He was named to the all-tournament team. Claremont guard Tyler Fraser was named MVP of the tournament. The junior added 14 points in the title game. Whittier (9-5), which earlier won the season-opening Bosco Tech tournament, was led by senior guard Anthony Rios with 18 points. Named to the all-tournament team from Whittier were senior guard Miguel Salazar (17 points) and Antonio Roberts (10 points). Whittier Christian 61, Chaffey 53, 2OT — Kacie Hunt had 17 points, Makenna Coleman added 13 points and Haley Hunt registered 10 points to lead the Heralds (6-7) to the of the Ontario Christian Tournament final-round victory. Whittier Christian 55, Godinez 47 — Christian Labadie had 20 points and Shane Dean added 15 points to lead the Heralds to the Leon Davis Tournament victory. 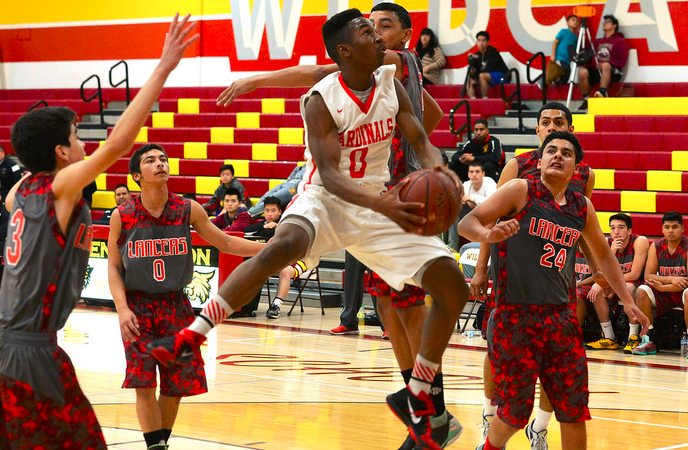 HACIENDA HEIGHTS — December was pretty good for the Whittier High School boys basketball team last season, and the Cardinals are continuing the trend this season. Miguel Salazar scored 15 points and Antonio Roberts had 10 to lead Whittier to a 65-33 victory over Bell Gardens on Tuesday in a “Battle for the Ball” Christmas Classic pool play game at Glen A. Wilson High School. The Cardinals, also getting nine points from Malik Pittman, improved to 9-4 and will face Claremont, a 78-63 winner over Long Beach Cabrillo, in today’s championship game at 7:30 p.m. at Wilson. Whittier is looking for its second tournament title in the month after wining the Bosco Tech Tournament to open the season. Ramiro Vargas and Robert Salas had 10 points each for the Lancers, who slipped to 4-8. La Serna vs. Carter, 4:30 p.m.
La Mirada vs. Crean Lutheran, 6:50 p.m.
Whittier vs. Claremont, 7:30 p.m.
Cantwell vs. Alta Loma, 7:30 p.m.
Flintridge Prep 57, Palmer 56 — Dante Fregoso had 19 points, Kendall Kikkawa added 17 points and Jake Althouse registered 13 points for the Rebels (7-0) in a first-round Santa Barbara Tournament victory. Whittier Christian 65, Anaheim 32 — Justin Osborn had 18 points and Shane Dean added 12 points for the Heralds in a Whittier Christian tournament win. Rowland 44, Whittier Christian 40 — Makenna Coleman had 11 points and Christa Evans added nine points for the Heralds in a Ontario Christian Tournament loss. FULLERTON — La Mirada High School may have lost two of its better players in seniors Vittorio Reynoso-Avila and Dylan Banks, but the setback isn’t showing on the basketball court.The Matadores, who won the CIF State Division II title last season, showed it again Monday. Anthony Newman scored 21 points to lead La Mirada to a 49-44 victory over Yorba Linda in the quarterfinals of the Orange Holiday Classic at Hope International University. Ian Carter, who had the game-winner in a 65-62 win over Cerritos Valley Christian on Saturday, had 14 points for the Matadores, who improved to 9-4. La Mirada will face either Foothill, of Santa Ana, or Tesoro in the Tuesday’s semifinals at 8:30 p.m. at Hope International. Zane Paddon and Eric Hezmalhalch had 13 points each for the Mustangs, who slipped to 10-3. MONROVIA — The St. Paul High School boys basketball team is undergoing a transformation. The Swordsmen have six victories, nearly matching the eight they have won the past two seasons. Transfers Louis Bangai and Jaylon Ballou will make sure St. Paul will easily beat that number, and definitely earn a lot more victories. On Monday, the Swordsmen (6-3) moved into Wednesday’s San Gabriel Valley Classic championship game with a 66-51 victory over host Monrovia. St. Paul plays Santiago at Monrovia on Tuesday at 5:30 p.m. in an off-bracket game. No matter who wins, the Swordsmen will play in the title game. Monrovia plays host to Arcadia at 4 p.m. in the other off-bracket game. No matter the result, the Wildcats go to Wednesday’s third-place game. Cameroon’s Bangai, who transferred from a Florida school five months ago, had 28 points, 18 rebounds and four blocked shots. Ballou, who last played in Texas, had 15 points, but was more impressive with his penetration and passes, including an alley-oop pass to Bangai for a dunk. La Mirada vs. Foothill, 8:30 p.m.
Whittier vs. Bell Gardens, 6 p.m.
La Serna vs. Yucaipa, 3 p.m.
California vs. Lakeside, 1:30 p.m.
Whittier Chr. vs. Buena Park, 7:30 p.m.
Whittier vs. Cantwell, 7:30 p.m.